*When the presidential debate dust finally settles, President Obama and GOP Presidential foe Mitt Romney will have spent a grand total of four and one half hours battering each other on who can do the best or worst job on tax reform, job creation, deficit reduction, staunching Iran’s nukes, and getting a grip on Middle East affairs. These are the same issues that the two have talked to near life support for months on end. The pundits, a big chunk of the media, and millions of Americans can virtually recite by rote the punch lines of both candidates on these issues. They are that familiar and worked over. The same can’t be said of the other equally big ticket items that affect tens of millions of American’s lives, pocketbooks and well-being. The most ignored of these ignored issues is poverty. The figures from every recent study and survey on poverty and income inequality are increasingly well-known and appalling. More Americans in recent years have sunk below the poverty line. Their income gap has widened to the greatest spread in decades. And more Americans have slid from what once was considered the middle-class into the ranks of the poor. Romney has uttered the word “poverty” a couple of times on the campaign trail, and Obama has referenced that people are hurting economically. But that’s about it. Education is a close second of the ignored issues. Obama and Romney could do a whole debate on this one. They can tell what’s right or wrong about charter schools versus public schools, and what they’d do to make both either more widespread in the case of charters, or more effective in the case of public schools. The U.S. has long had the dubious distinction of incarcerating more of its citizens than many nations combined. The number jailed has topped 2 million for several years. State legislators have pulled their hair out trying to figure out some way, any way, to get a handle on the surging incarceration numbers. They’ve farmed out inmates, wrestled with court orders to reduce the jail numbers, slashed budgets, and have come up with every kind of innovative alternative non-incarceration measure they can to end overcrowding. The close kin to that ignored issue is the drug war. It has wreaked havoc and mayhem on families, swamped prisons, and the courts, and ballooned state and federal prison budgets. Romney has been mute on the issue. Obama has taken quiet action to end the disparities in crack cocaine sentencing, and has hinted that drug reform will be a possible priority of his during his second term. But that’s where the talk on the issue has ended. Then there’s the housing crisis. The runaway number one reason for the financial tumble that shook the financial world and nearly collapsed the economy was the foreclosure debacle and the banks and financial industry’s well documented abuses of it. Tens of thousands of homebuyers were victimized by the housing crisis and they still are still with their homes underwater financially, facing foreclosure, and the free-fall drop in their personal wealth from plunged home equity. Romney and Obama have talked about the crisis, and Obama has tried mightily to put reforms in place to help thousands save their homes. But it’s been missing from the campaign debate. Civil rights have been ignored in presidential debates for two decades. The issue is now even more compelling with the Supreme Court’s pending affirmative action decision. Yet the virtual unwritten rule is the subject is out of bounds for debate. Race is simply too prickly, too charged, and too much of minefield that candidate fear to tread through. This is a natural segue to the debates that ignore what kind of Supreme Court Obama and Romney want to see. The Court will have a profound impact on law and public policy for years to come. There is an ocean wide gulf between Obama and Romney’s views of what kind of justices they like, and what their view of the role of the court should be in deciding law, and public policy issues. 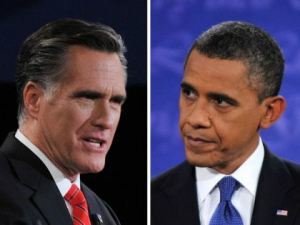 The jousts that Obama and Romney will engage in and the barbs they toss at each other in their debates tell much about which candidate is the niftiest and nimblest on their feet with a pointed response or rebuttal to an attack. Americans want presidents to be able to think on their feet and respond thoughtfully and swiftly to a crisis. They regard this as firm leadership. This instantly tags an administration as a resounding success or a dismal failure. But most Americans also want and demand some substance to go along with the style points that presidential debaters try to snag at the expense of the their opponent. This means above all talking about the issues, all the issues that impact on the lives of Americans. But when a handful of issues are cherry picked, and encoded as templates, that the candidates endlessly rehash, then the debates become thoroughly formula and predictable. This hasn’t changed during the past decade of presidential debates, and the Obama and Romney tiffs haven’t changed that either.